On a dark day, remind yourself that the world glows. There’s beauty everywhere, specifically in this case, through bioluminescence: it’s the production and emission of light by a living organism. You can find bioluminescent species all over the world. Here are 10 you can put on your list to research, and maybe find one day. Tip: take a friend. 1. Lampyris Noctiluca; the common glowworm of Europe. 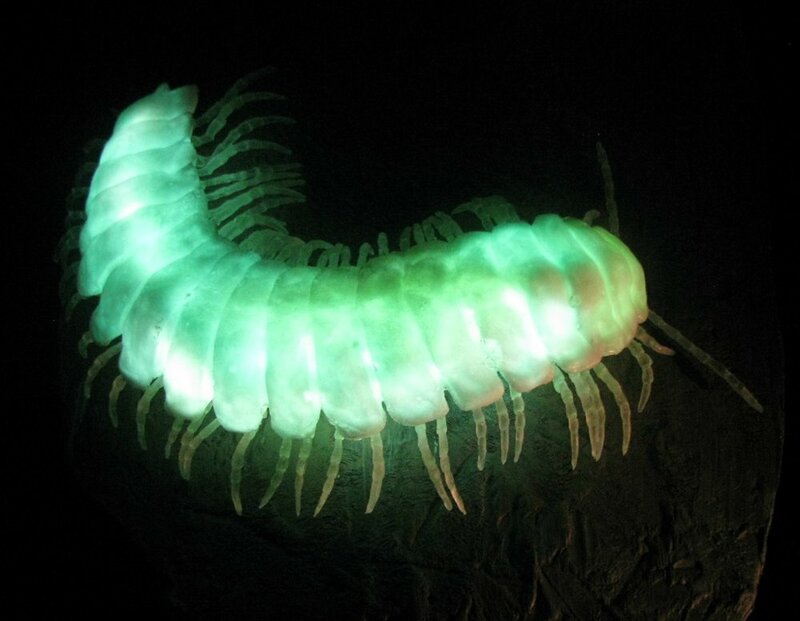 I only found out in my twenties, that these glowing creatures live in my area (The Netherlands), when I was walking home at night and saw one by accident in the street. Ever since, I try to see them once a year, during the few weeks when they are visible during their mating season. I’ve been able to capture a couple of videos of this species. The male fireflies of the species Lampyris Noctiluca are tiny and can fly, while the females cannot: she's a larviforme, much bigger than the male (and easier to capture on camera because she doesn’t move). Lampyridae or lightning bugs get busy around midsummer; they glow to attract a mate. You can spot them most likely between 10 and 12 in the evening. Individual dinoflagellates by itself hardly show a glow, but when they ‘bloom’ in numbers, you won’t miss the spectacular light they produce together. Panellus stipticus is a species of fungus, that is a widely distributed. It can be found in Asia, Australia, Europe and North America. 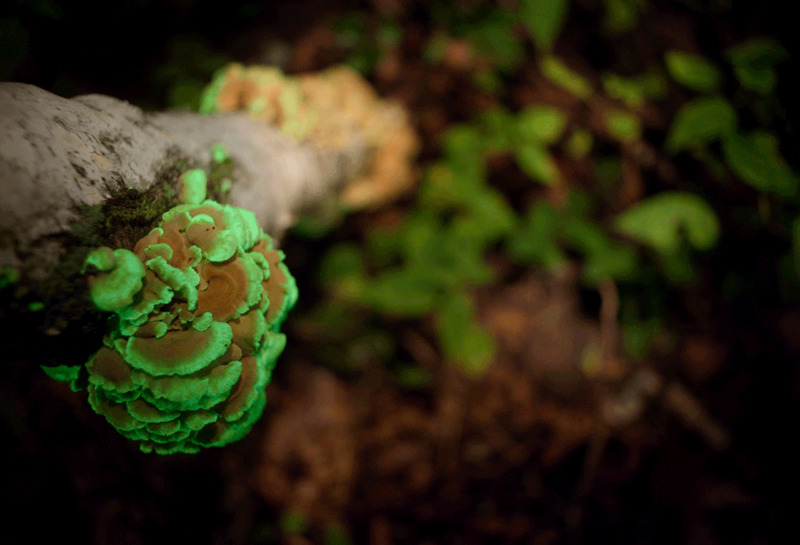 Bioluminescent fungi are found growing on decaying wood, which is why they are also referred to as “foxfire” or “glow wood”. They glow green in the dark. Tip: Find and identify them during the day, and come back at night! In July 2016, Dr. Earle received a grant from the National Geographic Society to return to the same deepwater coral beds she visited in 1979 for comparative observations of deep water biota, and the bioluminescent corals were captured for the first time in color HD Video. Don’t hide in your basement yet, because it’s not an alien.. It’s a Pyrosoma. A free-floating colonial turnicates, found in temperate waters worldwide. The name of the species refers to their bright bioluminescence sometimes emitted: pyro means ‘fire’ and soma means ‘body’. Pyrosomes can become up to 30 meters long and be blue, white or pink. Pyrosomes are planktonic, meaning their movements are largely controlled by the waves of the ocean, current and tides. “I have just watched the moon set in all her glory, and looked at those lesser moons, the beautiful Pyrosoma, shining like white-hot cylinders in the water” (T.H. Huxley, 1849). The pyrosome are quite rare to find and often exhibit waves of light passing back and forth through the colony. Each individual zooid detects light and then emits light in response. A glowing millipede! There are multiple Motyxia that are bioluminiscent, but the Motyxia sequoiae is special, because it glows so bright. Scientists believe the Motyxia sequoiae’s bioluminiscence is a response to heat and also serves as a warning signal; the bioluminescent proteins help neutralise the body's byproducts caused by heat, and the signal is a warning the sequoiae’s body contains poisonous cyanide. Considered by many glow fanatics as one of the most beautiful trips to make! This glow worm is a species of fungus gnat that lives only in New Zealand. You can find them easily in the Waitoma Caves in the North Island, and the Te Ana-au Caves in the South Island, which have become popular tourist attractions. National Geographic filmed an amazing 360° video where you can explore one of the caves yourself, and look around. Mycena chlorophos is a species of fungus that can be found in subtropical Asia, Sri Lanka, Australia and Brazil. 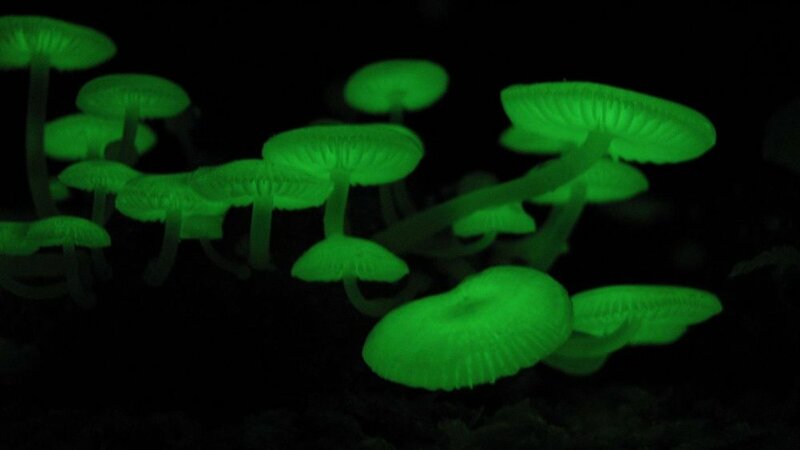 The mushrooms are bioluminescent and glow green in the dark. 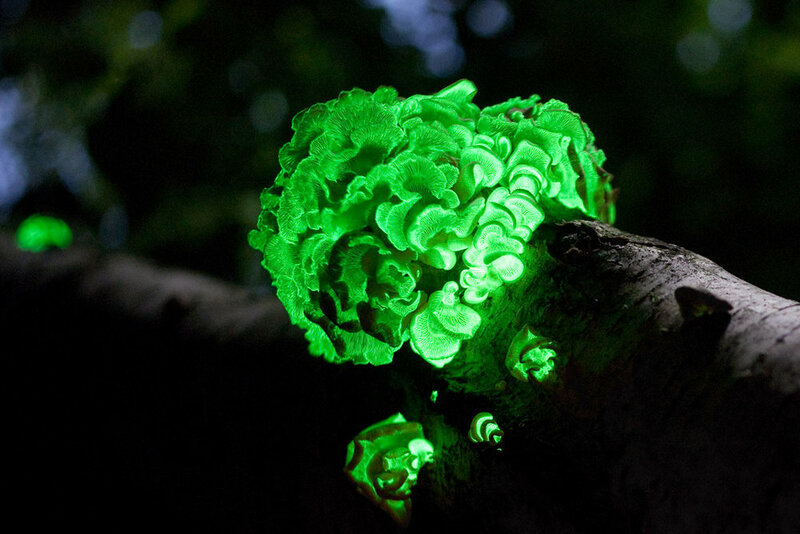 There are many more fungi that glow, but this is one of my favourites! It’s a type of shrimp that you can find around the southern Japanese coast. 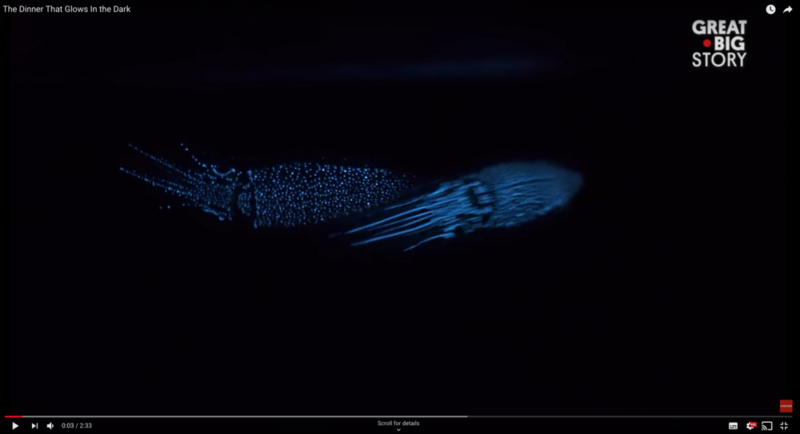 In the video on the right, you can see people observe the bioluminescent shrimp. Tdub Photo has captured a beautiful photo series of these creatures, including one named ‘The Weeping Stones’, where they scattered the shrimp over rocks. The firefly squid can be found in the Toyama Bay of Japan. While the ending of the video on the right is not vegetarian/vegan- friendly, the beginning shows the beautiful glow of the species, that often flood the beached in Japan with their glow. In case you’re inspired by bioluminescence, maybe you’ll enjoy this glow experiment concerning UV reactive paints.